A couple of days ago, I had a conversation about face (of all the things in the world:)) with one of my friends. We both fall into the same category of having chubby/round faces with skinny bodies. Often times, weight gain is first apparent on the face and is an indicator for me to go workout. In 2010, I got obsessed with running during early spring. I am talking about outdoor running, and not on tread mill. There was a good trail near to my house where many runners flocked. I tried running a couple of times and I got hooked. I ran about 10 K, three days a week and after about three weeks what I saw on the mirror really surprised me. I was looking at an absolutely toned face. Well, not just my face, in fact my whole body looked toned and I felt amazing. I was in my best shape. There is a reason why I am particular about running during early spring. Living in a country where the winters are harsh where I see runners running even when there is a blizzard, I still haven’t gotten comfortable running on snow. Also, it’s not healthy to run in freezing weather. On the other hand, in Summer it’s way too hot for me to run and I get exhausted very fast. Spring is the perfect weather for me to run, the air is chill and the cold wind that blows on our face will make our face work harder to keep warm and thus helping to shed fat. If you run for 30 minutes for three days a week in some what cold weather, you will attain a toned face in just a few weeks. Your face will look fresh, rejuvenated and healthy. Your mind will feel the same too. I’ve started my Spring running and I am already feeling better. So folks, if you are someone living in a Country where spring has just sprung, put on your running shoes and just run, run and run…Running outdoors is one of the best work outs which will give you immediate result. Happy Running! A few years ago, I wasn’t a big fan of salmon. Now, I am too fond of it. 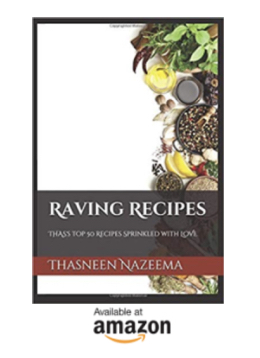 Every time I cook it, I rub it with different seasonings, hence I don’t get bored of the same taste. 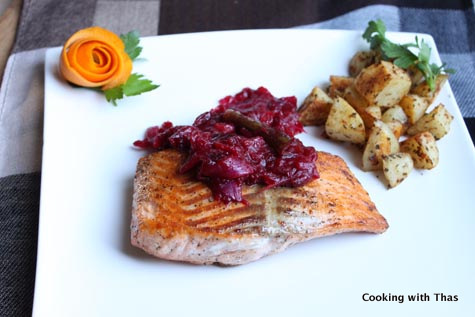 For last night’s dinner, I pan fried the salmon and served it with cranberry chutney. 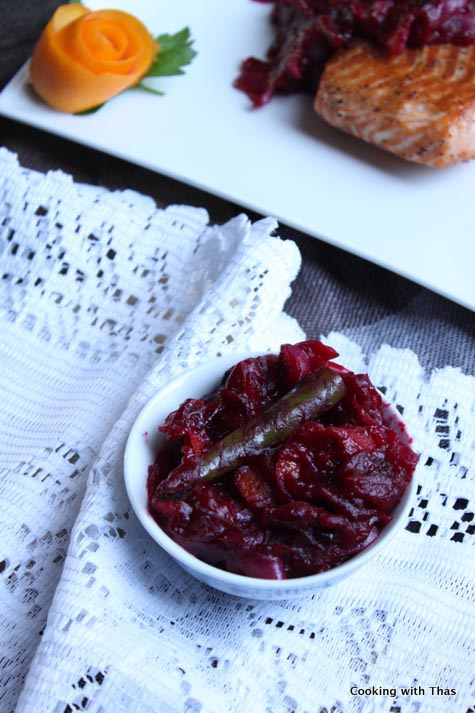 It was yummy, the sweetness and the slight bitterness from the cranberry chutney gave this dish a phenomenal taste. I also served oven roasted potatoes along with the salmon. It was a delicious and healthy dinner. Marinate the salmon fillet with ground pepper and salt, keep aside for 5 minutes. Heat a large non-stick pan, add olive oil and place the marinated salmon fillet. Pan fry till both sides of salmon turn light golden brown. Keep aside. Heat a saucepan, add oil. Add chopped onions, and a little salt, saute till onions turn translucent. Add halved green chilies and garlic, saute till onions turn light golden. Add cranberries and orange peel, combine well. Add water and cook covered till cranberries are mashed up. Add a few pinches of salt, combine well. Add brown cane sugar or jaggery, cook covered for a few minutes till it has melted. Have a taste, if the chutney is bitter add more cane sugar or jaggery till the chutney becomes slightly sweet. 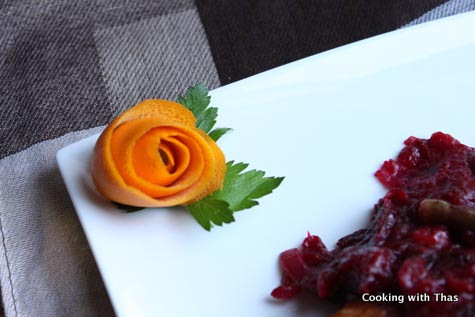 Before serving, discard the orange peel and green chilies from the cranberry chutney. 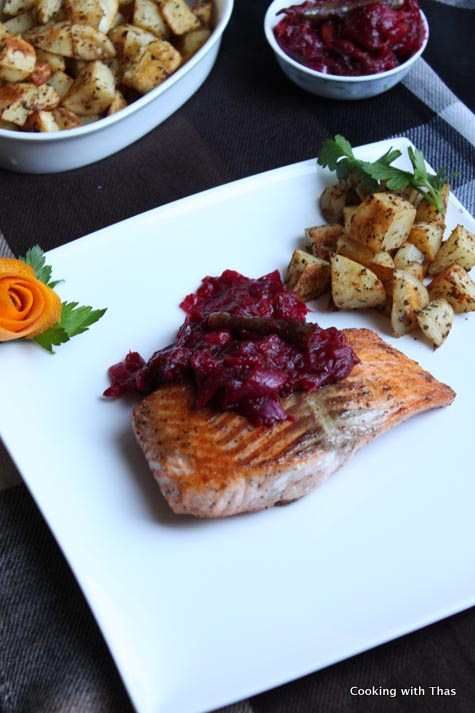 While serving, place the salmon on a plate, serve the cranberry chutney over the salmon. As a side serve oven roasted potatoes, mashed potatoes or steamed veggies.